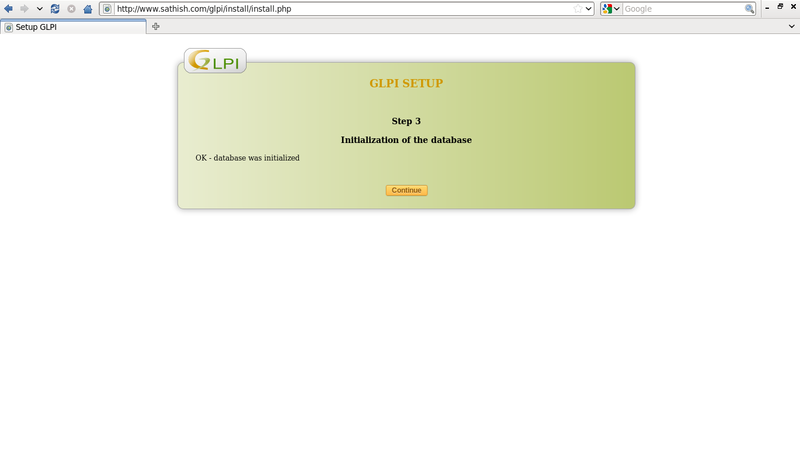 GLPI is the Information Resource-Manager with an additional Administration Interface. You can use it to build up a database with an inventory for your company. It has enhanced functions to make the daily life for the administrators easier, like a job-tracking-system with mail-notification and methods to build a database with basic information about your network-topology. GLPI has the following features. Inventory of computers, peripherals, network printers etc. Assignment of equipment by geographical area to users and groups. Management of business and financial information (purchase, guarantee and extension, damping). Management of applications for assistance of all types of equipment inventory. Interface to allow the user to file a support ticket. Business management, contracts, documents related to inventory items. Report generator for hardware, network or interventions. Multi-language support including 41 languages available. Moreover, GLPI has many plugins with added features. Now create a database called ‘glpidb’ and database user called ‘glpiuser’ with password ‘debian’ as described below. Move the extracted files to your webserver root document folder. Set Read/Write permissions of the following directories. http://domain-name/glpi and follow the onscreen instructions. You should see the following screen. Select your language and click Ok. 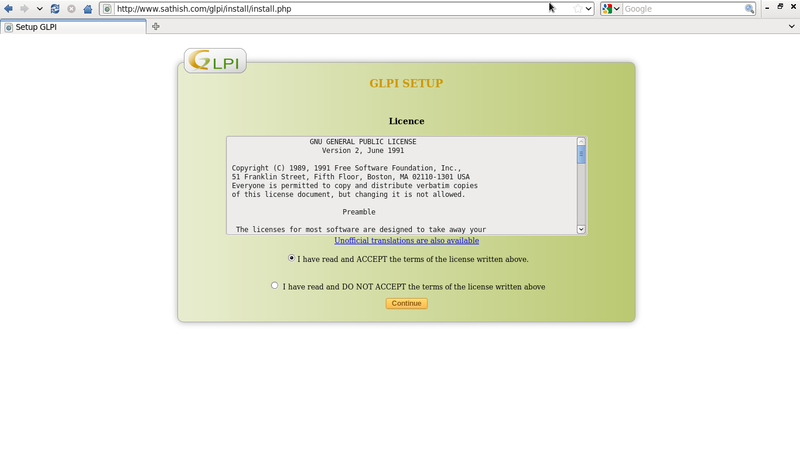 Setup GLPI – Accept the License agreement and click Ok. 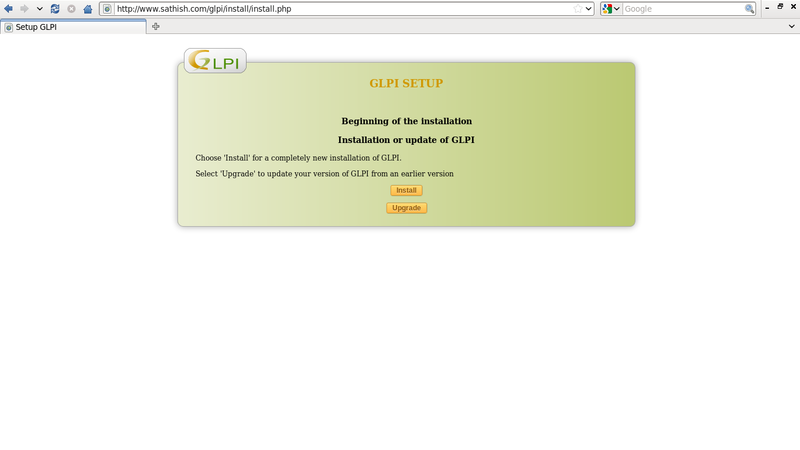 Setup GLPI – it is a new installation click Install button, else click Upgrade button to upgrade from old version to most recent new version. I want to install a fresh version of GLPI, hence i clicked Install button. 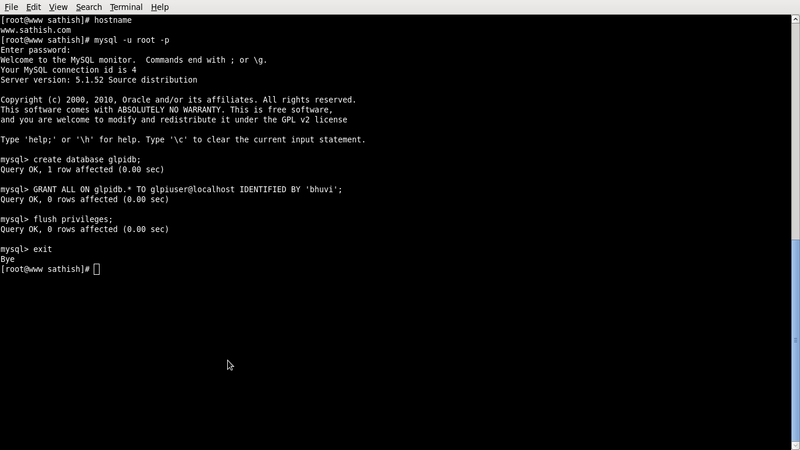 Setup GLPI – all seems well, you should see the following screen. If there are any errors, check for the file permissions and start over the installation again. 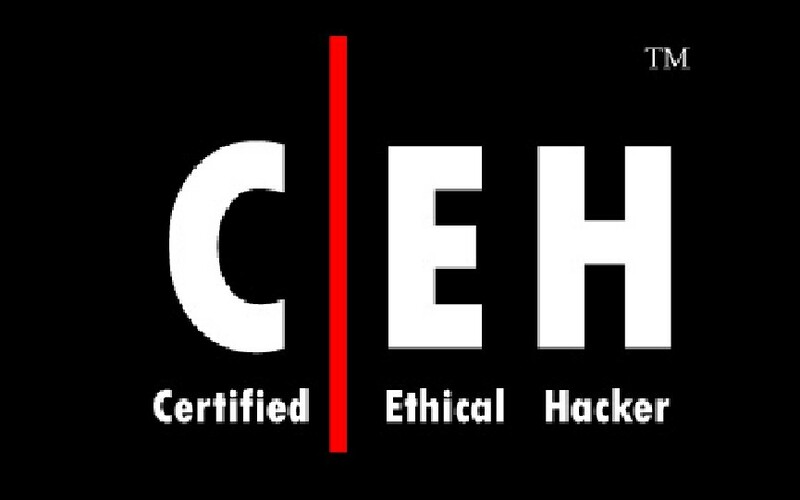 Enter the MySQL credentials such as hostname, user and password and click Continue. Setup GLPI – If you have already created a MySQL database it should have listed in the next screen as shown below, else you have to create a new one by clicking on the link Create new database. I have already created a database called ‘glpidb’, hence i selected it. Setup GLPI – Click Continue. Setup GLPI – Congratulations! We have installed GLPI on our server successfully. 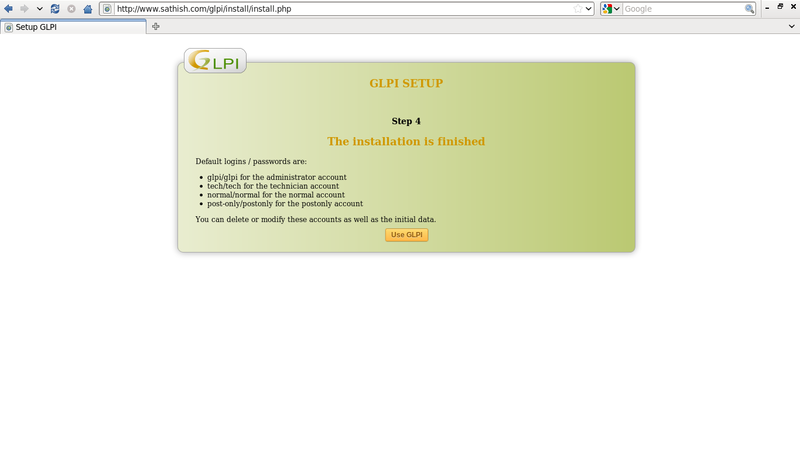 Setup GLPI – The default user accounts and their passwords will be shown in the above window. However i have listed them below for the sake of clarity. Please note them. You can change them later. Click Use GLPI to proceed. 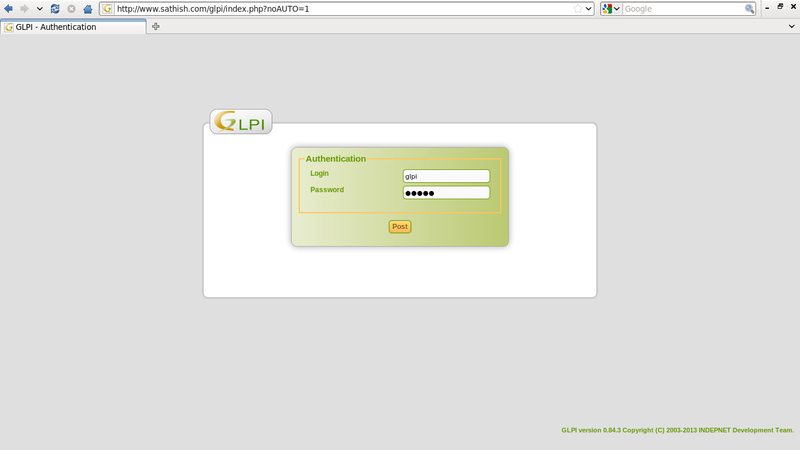 Let us log in to GLPI administrative Dashboard. The administrative user name is glpi and password is also glpi. Enter them and click Post. 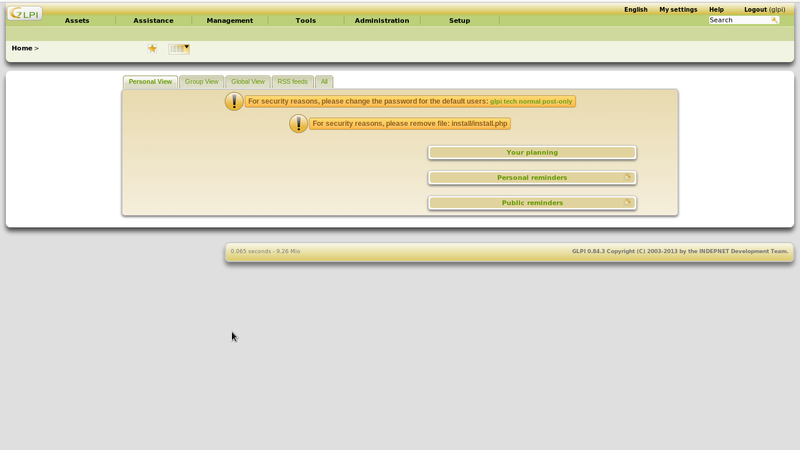 GLPI – Authentication – This is how my Administrative dashboard looks. 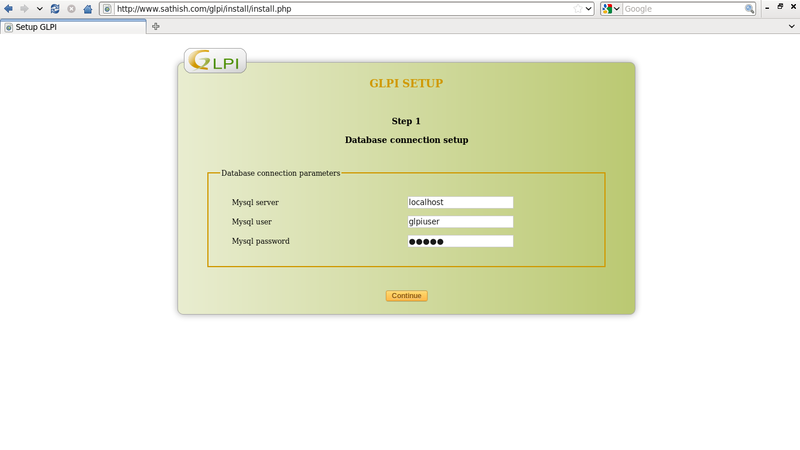 GLPI – Standard interface – At the first log in it will show some precautions that be made before using GLPI further. First you above to change the default users passwords for security reasons. To do that. 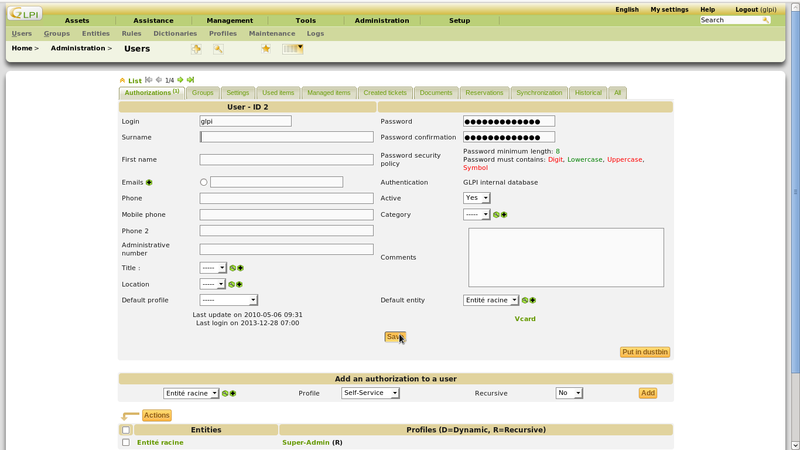 Go to Administration -> Users -> glpi and input your new password in the password column. And also you have to remove the install/install.php file for security reasons. If you made any mistakes or just forgot the password for the administrative account, you can re-run the above setup by deleting the following config/config.php file. After completing your installation change the permission of the config/config_db.php file to avoid any misconfiguration by users. 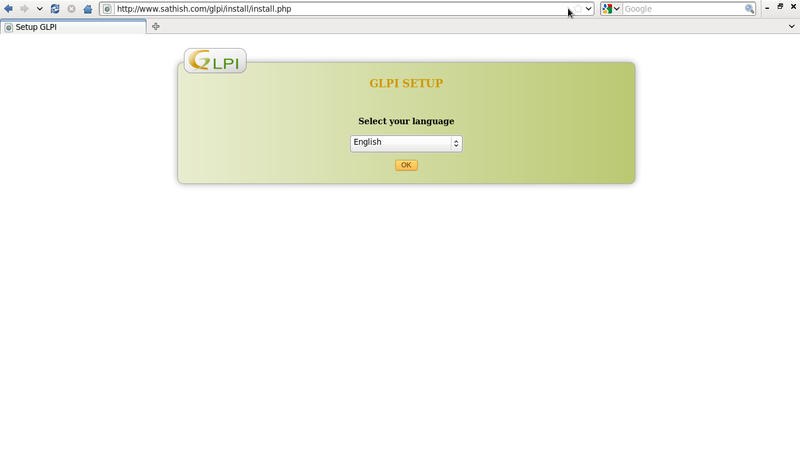 Now start using GLPI asset management system by navigating to http://ip-address/glpi. 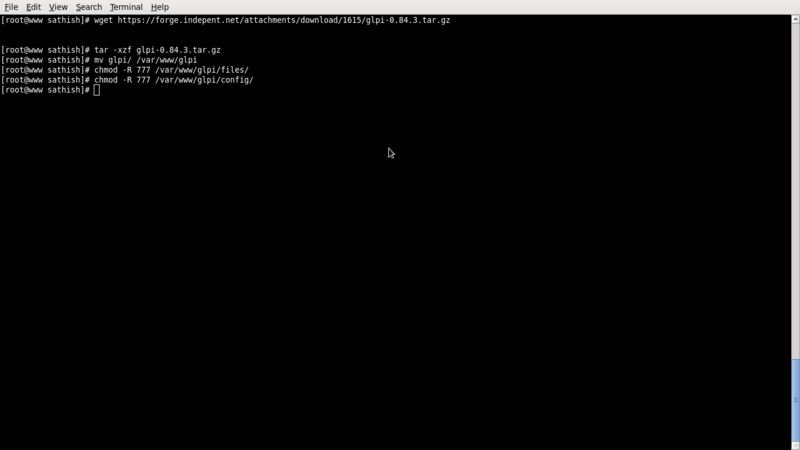 Hi, Now, under CentOs 7, you can use the command “yum install glpi” that can assist you with the installation.